Founded on Stran’s military 2-plus-2 hermaphroditic hybrid variant, the 12 channel version features 8 fiber optic termini (multimode or singlemode) and 4, 12 AWG contacts for modest power transmission. 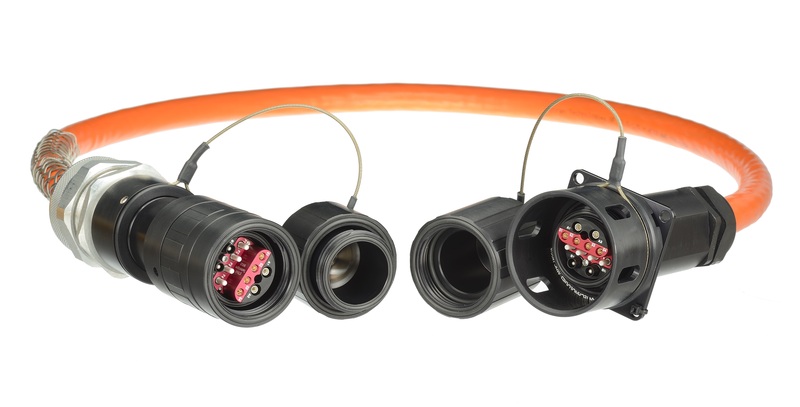 Rated at 600 volts, the contacts incorporate all of the features necessary to ensure user safety and operational compatibility with optical operation such as shrouded contacts that prevent contamination of the fiber termini during make-and-break cycles. Preserving its lineage of a hermaphroditic connector with internal circuit cross-over, longer cable haul lengths can be addressed in the field, by simply concatenating multiple cable segments together. Plug assemblies feature stainless steel cable grips for enhanced cable retention and strain relief. Internal electrical grounding for suppression of electrostatic discharge during mate is also provided. The receptacle incorporates a ‘centralizing shroud’ to facilitate blind mating of the hermaphroditic connector during ‘rig-up/rig-down’ operations.